Coffee-addicted Canadians now have one more excuse to slurp down double-doubles and scarf Timbits as they work, with Tim Hortons announcing free WiFi today. A majority of the coffee shops, which have arguably become part of the Canadian identity, will be offering customers wireless Internet access by September. Bell Canada is providing the service and has completed six months of testing the new connections with multiple service providers, a press release says. Canadians can now treat Tim Hortons as a remote office. Though it seems like there are too many Tim Hortons restaurants to count, there are in fact 3,315 of them in Canada and more than 2,000 will get WiFi service. There are 721 Tim Hortons locations in the U.S. and six in the Gulf Cooperation Council (an international organization that includes Arab states such as Saudi Arabia and United Arab Emirates). 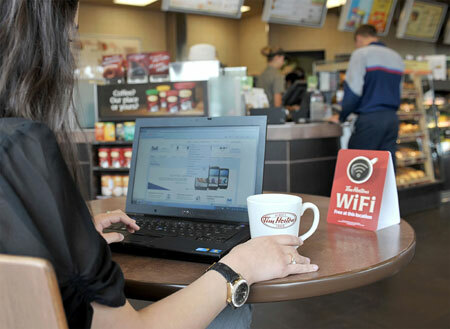 Ninety per cent of Tim Hortons’ restaurants will have WiFi access, the company says. Non-traditional locations such as gas station kiosks, hospital counters, or self-serve areas will not have WiFi. Free WiFi has become almost an expectation at coffee shops in a connected world. In Canada, coffee drinkers who are looking for an Internet fix in addition to a caffeine boost can log in at McDonalds, Starbucks, and Second Cup to name a few.